While visiting my son’s apartment, I spent the afternoon reading this small book which is in a series on church history. Having been in England many times and being interested in its history, especially from Henry VIII forward, I found this book fascinating. Thomas Cranmer (1489-1556) was an evangelical force behind Henry VIII’s departure from the Roman Catholic Church and establishing of the Church of England with the King as Supreme Head. 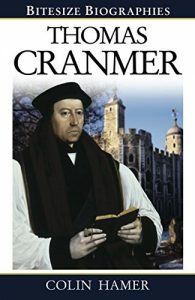 Cranmer served as Archbishop of Canterbury during the reigns of Henry, his son Edward, Mary Tudor, or “bloody Mary,” under whose rule he was executed. Cranmer supported Henry’s annulment of marriage to Catherine of Aragon so he could marry Anne Boleyn, the first and second of the six wives of Henry VIII. This was against Catholic marriage law and caused Henry, with Cranmer’s support, to declare the Church of England a separate, mostly Protestant Church with the King as Head. The next three rulers of England were Henry’s children by different wives: Edward VI by Jane Seymour, Mary Tudor by Catherine of Aragon, and Elizabeth I by Anne Boleyn. Mary Tudor (Bloody Mary) tried to return the Church to Rome and so Thomas Cranmer was in trouble for previously supporting the departure. He was arrested with two other evangelical preachers, Hugh Latimer and Nicholas Ridley and sentenced to burn at the stake. In an unfortunate twist of history, though Latimer and Ridley burned in Oxford, Cranmer recanted and was spared—for a while. Later, however, at Mary’s increased hounding, Cranmer was again sentenced and this time went to the flames. He first extended his “unworthy” hand that had written the recantation into the fire, saying, “This which hath sinned, having signed the writing, must be the first to suffer punishment,” and then he was burned himself in the fire.